Pixie has a beautiful white coat with a brown spot on her tail with light brown freckles all over. She is 8 months old and she is fully trained. She has a big heart and is very loyal. She is our cuddle buddy and she always knows when something is wrong. She will military crawl up to you and attack you with kisses and fall asleep with one paw on you, like she is hugging you. She was from a litter of 9 and she was one of the smaller ones. Our friends have one of her brothers and they see each other once in a while. She is very good with other dogs and kids, so I cannot wait for the future with her! Nimbus is 11 weeks old and we rescued him out of a backyard that had the whole litter! There were eight of them, no water or food or shelter...and we are in Phoenix, ARIZONA! We called a rescue shelter to get the rest of them and we took little Nimbus home and nursed him back to health. The puppies were all skin and bone and bloated from worms and it was so devastating to see something like this in person rather than online because it hits you harder. I was in tears when I saw them and I am so happy we did because we saved 8 beautiful lives. When we took Nimbus home, we didn't know what to do. He just went and laid down. We gave him wet food and he ate so much of it, he was such a happy boy. He fell asleep right on our chests within seconds. Pixie loved him and was careful with him right from the start! He now knows a few simple commands and is pretty much potty trained. Both of these lovely puppies are my boyfriend and I's best friends and we absolutely love them! I hope you do too! God bless your heart for rescuing those two adorable pups. As you already know, you'll have two very loyal dogs on your hands. Keep up the training, because training never ends. Give them plenty of exercise and enjoy them every day. 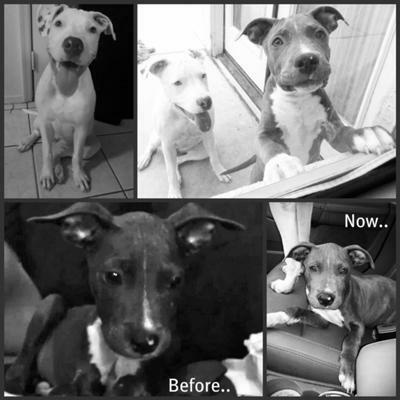 I got my Pitty when she was four month old and she is on the way to become a certified Therapy dog (see Odyssey, a pit bull in Las Vegas on this site). Pixie we got from a friend's litter and then we rescued Nimbus and all of his brothers and sisters! And we hope to make at least one of our dogs a therapy dog for my boyfriend's brother! Thank you so much and best wishes to you too! !